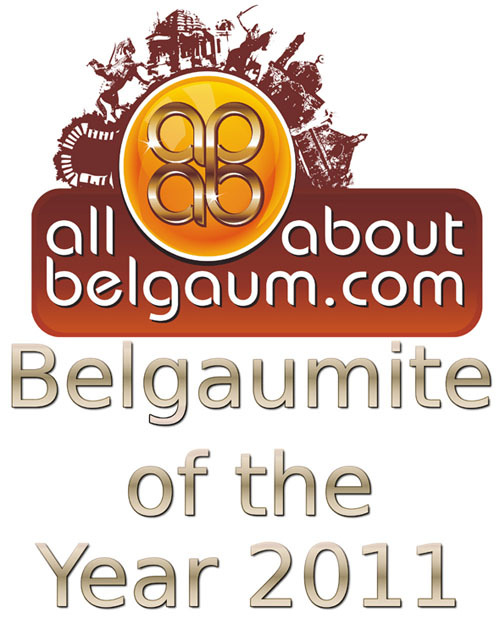 Here is your chance to nominate for the AllAboutBelgaum.com’s Belgaumite of the Year 2011. You can send in nominations other than the ones mentioned below by 14 December 2011. After that a shortlisted nominations will be open for voting which will be selected by the AAB panel. The Belgaumite of the year 2011 would be selected by online voting which will be open to all. One can nominate any individual who has contributed significantly to the welfare of Belgaum or who has excelled exemplary in his own field in the year 2011. (from January 2011 to December 2011). Hence readers are requested to nominate by making comments or send a mail to [email protected] with the achievement in short. R.K.Patil, CEO, Vayavya Labs, Belgaum for having received a USD 1 million funding from Indian Angel Network (IAN), one of the leading Angel Investors Nerworks and placing Belgaum on the Global semi-conductor map. Atish Jadhav, the specially abled child for having surmounted various odds in winning the Gold Medal in 400 metres Freestyle at the Special Olympiad held at Athens, Greece. Rohan Kokane for creating a new World record by limbo skating a distance of 38.68 metres (126 ft, 11 in) under cars and therey entering the Guiness Book of World Records. Sandeep Patil, IPS, Superintendent of Police Belgaum for his exemplary work in reaching out to the people through various initiatives including Janata Darshans, for keeping the Matka menace under check, and for maintaining law and order in a challenging environment. Event management: Personnel from AAB or appointed/engaged by AAB, who are responsible for the conduct of the Event, includes the jury appointed by AAB. Any individual who has contributed significantly to the welfare of Belgaum in th year 2011. Any individual from Belgaum who’s achieved a significant feat in the year 2011. Any individual from Belgaum who’s brought laurels and fame to Belgaum in the year 2011. Any individual who has made Belgaum proud in the year 2011. Contestants: Top 15 (if available) Applicants short listed after evaluation by the Initial Jury in Phase 1. Nominees: Based on the emails received from the readers in the form of nominees that need to be awarded, all nominees achievements and profiles will be carefully evaluated by a hand picked jury chosen by AllAboutBelgaum.com. A filtered list of three-ten nominees chosen by the AAB jury will be put on AllAboutBelgaum.com on the 23st of December 2011 for public voting. Winner: One Event Winner would be arrived at through evaluation by the Final Jury and by means of online voting by the public from 24st December 2011 to 02nd January 2011. Initial Jury: Group of persons selected by the Event management company & AAB who will evaluate the Applicants, Contestants and Nominees. Final Jury: Group of persons selected by the Event management & AAB who will evaluate the Finalists. It is mr Sandeep patil, for the first time saw the heroism of a police officer,,,,live…attending to the problems of people directly and ensuring it's resolved with immediate action,,,,,,and restoring faith in police..
My vote would be for Sandeep Patil the dashing IPS officer (Belgaum SP). The reason why I am voting for him is he brought all Belgaumites together. The Belgaum is not easy city to handle for any IPS officers but he handled it very well and we saw the results last week. We saw historical moments last week which was not happened for last 50 years i.e integrity in different diversity. All credits goes to Mr Sandeep and his good service (Honesty). There are so many entrepreneurs who set business in Belgaum City for Best climate,Low cost of living and Utter most important thing Labour cost is very very low. as compare to Bangalore and US It has nothing to do with Development of Belgaum City. Yes,you are perfectly right.No entrepreneur has nothing to do with all other three nominees. There is no comparison ground when we compare the progress achieved by other 3 nominees . Sandip Patil SP o of course ,there is no need to mention. Sandeep Patil the numero uno!